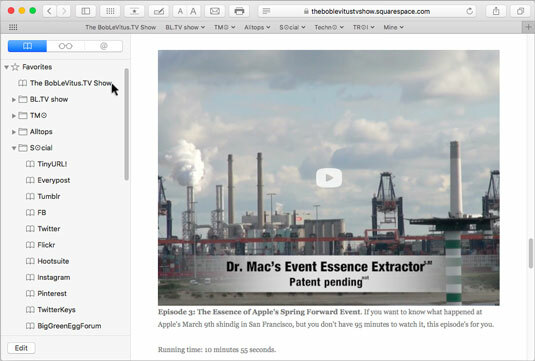 In Safari, the web browser installed with OS X El Capitan, click the Sidebar button on the toolbar to show or hide the Safari Sidebar, which has three tabs — Favorites, Reading List, and Shared Links. When you find a web page you want to remember and return to, you bookmark it. Choose Bookmarks→Add Bookmark, press Command+D, or click the Share button and choose Add Bookmark. Choose where to store the bookmark from the pop-up menu, as shown here. By default, Safari puts them in the Favorites folder. Rename the bookmark or use the name provided by Safari. 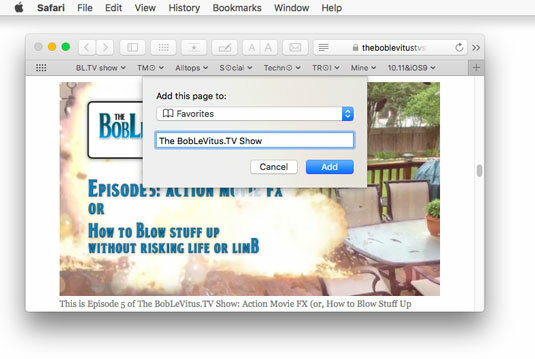 If you accept the name Safari suggested, this page will appear in the Favorites bar as The BobLeVitus.TV Show. Click the Add button to save the bookmark. To return to a bookmarked page, click it in the Favorites bar, choose Bookmarks→Show Bookmarks, press Command+Option+B, or click the Show Sidebar button to see all your bookmarks in the Sidebar, as shown. If you add the Bookmark to the Favorites folder (as shown), it automatically appears in the Favorites bar; if you add the bookmark outside the Favorites folder in the Sidebar, it will not appear in the Favorites bar but will be available at the bottom of the Bookmarks menu and in the Bookmarks Sidebar. Open bookmarked pages in the Sidebar by clicking them. View the contents of folders (such as Favorites, BL.TV show, Techno, TMO, Alltops, and Social in the figure) by single-clicking their name in the list. The figure shows, in particular, the contents of the Favorites bar folder with the contents of the Social subfolder expanded. To organize your Bookmarks window or place bookmarks on the toolbar or Bookmarks menu, move bookmarks by dragging them. You can place bookmarks and folders of bookmarks on the Safari Favorites bar or in the Bookmarks menu by dragging them to the appropriate folder. If you drag a folder of bookmarks to the Favorites folder (or directly onto the Favorites bar itself), the result is a drop-down menu. To delete a bookmark, right- or Control+click it and choose Delete. Command+click a folder in the Bookmarks window or Favorites bar to simultaneously open all the bookmarks it contains. You’ve probably noticed this handy behavior by now, but it’s worth mentioning: When you click in the empty Search or Enter Website Name field, a sheet drops down displaying your Favorites; The sheet is replaced by a list of search results and suggestions as soon as you type the first character. Understandably, the sheet doesn’t appear if the current page is Favorites or Top Sites. But it’s a convenient feature. Last but not least, Safari gained a fabulous new feature in El Capitan — a little blue speaker icon that appears in on the right side of the Search or Enter Website Name field if audio is playing on any page. Click the speaker and Safari will go silent even if the audio is coming from an inactive tab or a hidden window. The Reading List serves as a repository for pages or links you want to read but don’t want to read right now. It’s a lot like a bookmark but easier to create on the fly, which makes the Reading List perfect for sites or links you don’t need to keep forever (that’s what bookmarks are for). To see your Reading List, click the Show Sidebar icon and then click the Reading List tab (shown here). Adding the current page to the Reading List. To add a link to your Reading List without actually visiting the page, just press the Shift key before you click a link. It’s fast and easy, and it works even if the Sidebar is closed. Or you can right- or Control-click the link and choose Add to Reading List from the contextual menu. 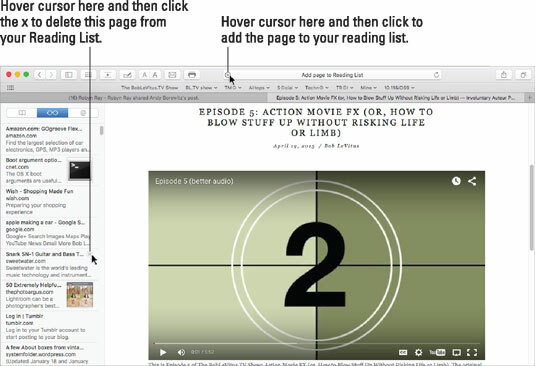 To delete an item from the Reading List, hover the cursor over it and then click the little x that appears in its upper-right corner (as shown for the Snark SN-1 item in the figure), or right- or Control-click the item and then choose Remove Item. If you have other Macs or iDevices, you can sync your Reading List among your devices by enabling Safari in the iCloud System Preferences pane. What the heck is a shared link? Shared Links is a cool feature that aggregates links shared by your friends on Twitter, Facebook, and other social media sites you’ve enabled in Internet Accounts or Extensions System Preferences panes as well as RSS feeds you’ve enabled by clicking the Subscriptions button at the bottom of the Sidebar. Then Shared Links displays them in a chronological list. And that is what Shared Links is all about.